Is there a possibility to cure or remove the varicose veins in my arms? Is there a possibility to cure or remove the varicose veins in my arms? I had the schlero therapy procedure done already. Arm veins can be treated usually by sclerotherapy or microphlebectomies or a combination of both. If you have already had sclerotherapy, you may require more sclerotherapy or microphlebectomies. This is assuming there is no underlying abnormal reason for the veins. You should see someone with experience treating these veins. Varicose veins on the arms are quite rare. Prominent normal veins can be confused with varicose veins. 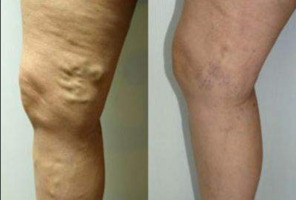 If indeed the effected veins are varicose, one failed trial of sclerotherapy may not disqualify further sclerotherapy using additional techniques. Surgical excision remains an option, however I would insure that the veins are abnormal and varicose and consider alternate sclerotherapy methods. If they are really varicose veins, then yes. However, it's very important to find out what is causing them. Also, if they are normal veins I recommend against having them treated. I generally do not recommend treatment of otherwise normal but prominent arm veins.